The Diocese was founded in 1841 to serve nine congregations in the state. After the Civil War, the diocese grew to 51 congregations and four missions. Trinity was founded in 1870 as a mission church and the church was dedicated in 1873. In 1886, the Diocesan Convention approved splitting the diocese into eastern and western sections; Trinity is part of the eastern section, headed by the Right Reverend George Wayne Smith. Trinity’s first church was damaged by fire in 1907. Rev. 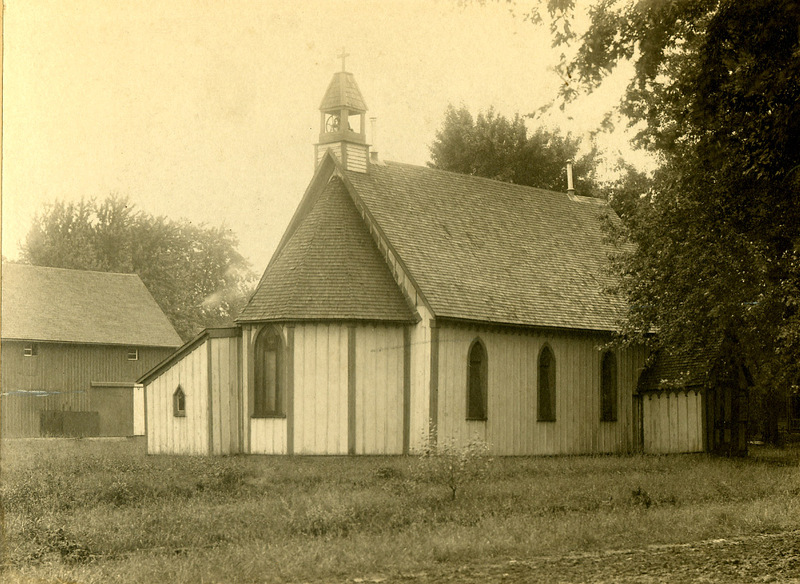 Putney requested Diocesan funding to match local pledges for a new church in 1915. The church was consecrated in 1917 and uses the design principles advocated by the Cambridge Camden Society for rural Episcopal churches. Added American Craftsman details help the church blend with neighboring homes. Trinity is on the National Register of Historic Places. Trinity declined in the mid-1920s and the Diocese authorized closure in 1928. The building was deconsecrated and put up for sale. Because of the Great Depression, there were no buyers. Community members talked with the Right Reverend William Scarlett who reopened the church in 1939. We have been an active mission church ever since. At various times in Trinity’s history, leaders reflected on the importance of the church’s place in Kirksville (as in 1925 Letter About Trinity Mission and 1980 Letter About Stewardship). The current altar was built and installed in the early 1980s. The sacristy was remodeled in 2003; the nursery and narthex were refurbished in 2004. 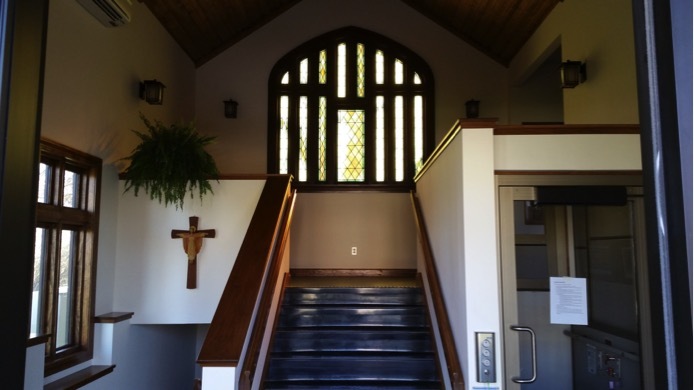 After several years of planning, in 2013 the congregation undertook an accessibility project which added three handicapped restrooms and a wheelchair accessible lift as part of an addition to the original building. 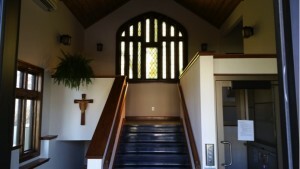 Trinity is the only Episcopal church in northeast Missouri. Within the city of Kirksville there are three college campuses. Trinity is also a mission church of the Diocese of Missouri. Because of these three factors, the Diocese of Missouri supports us financially. In 2013 we undertook a capital campaign for the construction of an accessibility entrance to our 100-year-old building. This resulted in a $381,385 building project. Through pledges, fundraisers, grants and gifts the parish raised over half of the funds needed. To pay for the remaining project costs a ten-year loan of $133,200 was secured though the Diocese of Missouri. Efforts to raise funds to pay back the loan have involved much of the congregation, and have involved a number of creative approaches, including a social media campaign, a video appeal, special concerts, and dinners. Our number of pledging members has been around 30 for the last five years. Our average Sunday attendance has been around 39 during this same time frame. 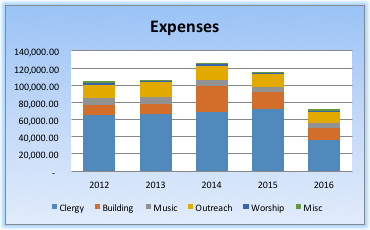 The major expenditures for Trinity each year include clergy expenses, the music program which includes a paid music director, and costs to maintain our two buildings: the church and the vicarage. The outreach line item includes our Diocesan assessment and pass thru from the Diocese for our college peer minister and from plate collection for specific outreach efforts. The financial future for Trinity is unfolding. We have a small amount of money in savings and investments to meet unforeseen or emergency needs. 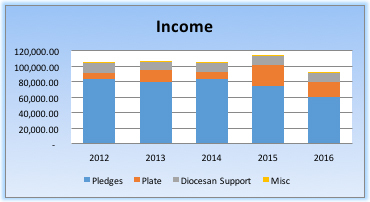 However, due to the continued loan payments and the decrease in the total pledged amount for 2017, in the future we will need to provide opportunities for the congregation and the diocese to explore ways to meet our future financial obligations. Our end of year income and expenses for the last five years are presented below. Our account balances as of the end of 2016 total $122,355.75. Our outstanding loan balance is $111,586.38.